A few days ago I had some puff pastry left over from one of my cooking classes, and given the autumn chill, I decided to make a chicken pot pie. I used to love these growing up, and my mother loved making them-- remove from freezer, open box and bake 40 minutes. My recipe is not quite that simple as it is made from scratch, but short of a frozen entree, this chicken pot pie is as easy as it gets. Don't be intimidated by the ingredients. The foundation for this savory baked pie is the mirepoix (diced onion, celery and carrot) which you can purchase from Trader Joe's. Now how's that for convenient? Feel free to leave out whatever veggies you don't have on hand, and don't be afraid of frozen vegetables. If you're tight on time, they can be a great shortcut. Enjoy, and watch my step-by-step video for additional cooking tips. 3 C. shredded chicken - I like to poach 2 chicken breasts in water with a few bay leaves for an hour, them removed the meat and shred. Leftover cooked chicken is fine too. 1 package puff pastry/ pie crust or even biscuit dough- these are all readily available. Saute onion and mushrooms in olive oil and 1 Tbs. butter in a large nonstick pan on medium high heat. After 1 minute, add celery and carrots. Continue cooking for another minute or two and add frozen corn and peas. Season with salt, Greek seasoning and pepper and remove from heat. Add chicken and vegetables to a bowl and set aside. In the same pan, melt remaining 2 Tbs. butter, once melted, sprinkle flour and whisk until combined and thick. Add 1 C. chicken stock or water and continue whisking until completely combined. Add to bowl and stir to combine. 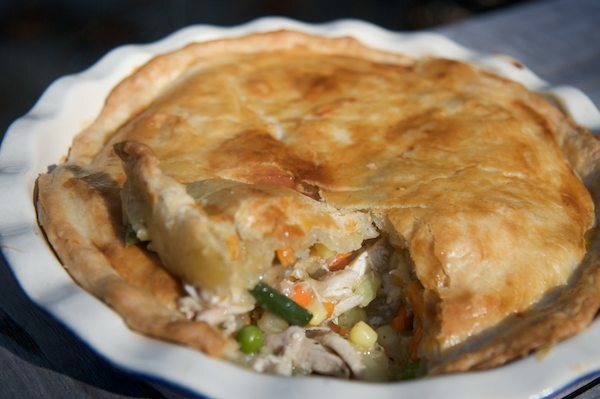 Add vegetables and chicken to a deep oven-proof dish and cover with puff pastry, pie crust or biscuit dough. Brush pastry with egg wash before baking, this gives the pastry a nice shiny crust. Bake in oven to 30-35 minutes. Lower heat to 350 if the pastry is getting too brown. Serve with a green salad.